TRAINING DATES - SEE IMPORTANT INFORMATION BELOW!!!! Click the ETRC Calendar link for training dates. ETRC has permission from the Roane Alliance to use some 400 acres of mixed grass and woodlands for training. Karen Edwards and Jim Pearce, who own adjoining land, have also given permission for the use of their 1.1 acre deepwater pond for water work. This pond is a large oval with a flat deepwater entry at the dam, a shallow water entry at the opposite end, and steep entries on both sides. From Knoxville: Take I-40 West towards Nashville, stay right on I-40 at the I-75/I-40 split. Go 4.1 miles. Take exit 364 for TN-95 toward U.S. 321 West/Lenoir City/Oak Ridge and turn right onto TN-95 at the end of the exit ramp. Go 4/10 mile and take the first left onto Buttermilk Road West. Go one mile. Take the 2nd right onto Sam Rayburn Parkway. Go 5/10 mile. Take the second left onto Pawnook Farm Road. Pass by a small tan block building with racing stripes on the right (Pegasus Technologies). From Points East: Take I-40 East toward Knoxville. Take the exit "Industrial Park Road" Turn left onto Industrial Park Road and cross over the Interstate. Go 3/10 mile. Take the first right onto Buttermilk Road West into the Roane Regional business park. H. T. Hackney plant will be on your left. Go 1.2 miles. Turn left on Sam Rayburn Parkway. Go 5/10 mile. Take the 2nd left onto Pawnook Farm Road. 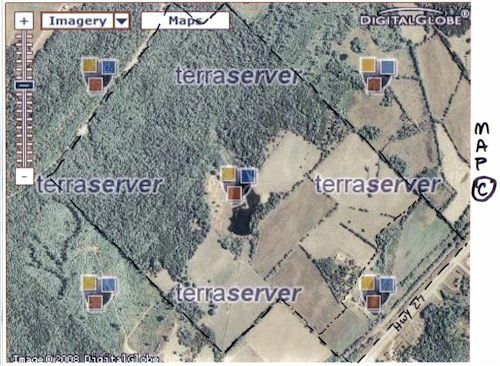 Pass by a small tan block building with racing stripes (Pegasus Technologies) and take the next right onto a dirt/gravel road through the woods onto the property. This agreement can be revoked with a 30 day notice. Users will keep property in good condition, not cut trees or bushes, and will keep the property free of ruts. Users will not conduct activities in a noisy or disturbing manner which would constitute a nuisance. Use of live ammo is prohibited; poppers and bumper boys may be used. The only ducks that may be used on the property are farm-raised ducks with the proper identification. Do not bring frozen hunted ducks from home! Arrangements for organized training must be made by Wednesday of the week the property will be used. This will give the property liaison (Karen Edwards, edwardskc@att.net) time to contact the property owners to make sure that no other activities such as haying or sales visits are being made during the time ETRC wishes to use the site. 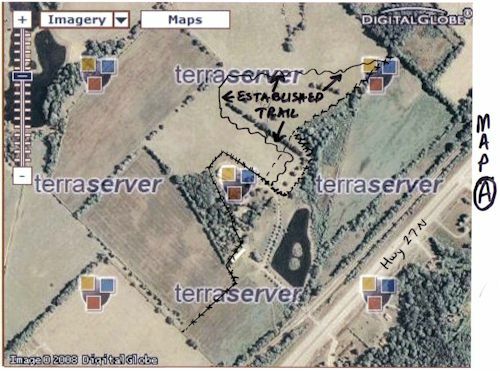 ETRC has permission from Mr. Richard Kinzalow to use his 450-acre farm for training. The farm has large fields and two large ponds. The Kinzalow Farm in Spring City is available on the 1st and 3rd Wednesdays and 2nd and 4th Saturdays of each month. Specific days for organized training will be announced on the Events Calendar, via e-mail or newsletter. Other days are available on an ad-hoc basis but a member of the Board must be present to open the gate and remain on the property while training is underway. Contact Brent McCoy at dukboy02@bellsouth.net if you want to schedule a training session. The combination lock on the front gate has a new combination effective January 1, 2012. Only the ETRC board and officers will have the correct combination. Training is restricted to the front pond and the two fields on the right and left of the pond until May. From Exit 347 Interstate 40 in Rockwood, TN take Hwy 27 South 20 miles. The farm is located 1-1/2 mile North of Spring City, TN on four-lane Hwy 27. Turn onto Hale Bopp Lane to drive directly into the property at mile marker 25. A convenience store, 27 Market, is directly across the highway from Hale Bopp Lane. (b) AKC sanctioned retriever competition by request from ETRC to Hale Bopp Hunt Club for a three-day event. (d) The field west of the back lake is planted for wildlife and should not be disturbed. Vehicles, by the request of the Owner and HBHC, shall be confined to designated trails throughout the Property. (e) ETRC will ensure that all of its members, employees, guests, and agents will carry permission documentation to be on the Property at all times when present thereon and present documentation when requested. Officers and board members will implement and manage the above listed rules. (f) Agreement is valid 8/15/11 through 8/15/2012. ALL GATES MUST BE KEPT CLOSED TO KEEP CATTLE INSIDE THE FIELDS. Mr. Kinzalow emphasized this is the most important rule. If this rule is broken, we WILL lose the farm. NO DRIVING IN FIELDS. Park around the edge of the fields. There are gravel driveways around both ponds. Park along either side of the driveways. ATV’s with trailers may be use to haul equipment but stay close to edges of fields. DO NOT TRAIN IN THE HAY FIELDS. New members are invited to attend training sessions to participate or watch. An organized training group will be set up at least twice a month (weather permitting) to learn and practice the basics of the AKC Hunt Tests. Advanced training groups may train on their own in separate fields. E-mail notices to all members will announce dates of organized training groups. Bring your retriever, a chair, water, training gear and join the fun. ETRC members tackle clean-up of our new training grounds.